In this post, we'll look at what to do before a winter storm. By staying informed, stocking up on the right supplies, preparing your vehicle and ensuring you have a steady supply of heat, you can keep yourself and your family safe and warm. First, it’s important to be aware of what sort of winter storm is heading to your area to prepare properly and to stay aware of hazardous conditions throughout the storm. There are several ways you can listen to updates from meteorologists, including the news or weather channel on television, weather apps, websites or radio. Keep in mind that winter storms can cause your TV or Internet to cut out, so it’s safest to have a radio on hand that you can receive weather updates through, even if it just serves as a backup option. With a National Oceanic and Atmospheric Administration (NOAA) weather radio receiver, you can receive real-time alerts and warnings for any weather-related issues in your area, even when other communication channels become compromised. When you look up or listen to updates, they’re only helpful if you understand what the different labels for a winter storm mean. Let’s take a look at three winter storm notifications you should know about. Winter storm watch: A watch merely means meteorologists see the potential for severe winter weather in the next 36 to 48 hours. The possible winter storm event could include heavy snow, blowing snow, ice storms, heavy sleet or a combination. When a winter storm watch is in effect, now is the time to make any necessary last-minute preparations. Winter weather advisory: An advisory means there is currently winter weather, such as snow, ice or sleet, that may make driving conditions hazardous, but not enough to merit a winter storm warning. When your area's under a winter weather advisory, you should be especially cautious when going outside or driving. Winter storm warning: The National Weather Service issues a winter storm warning when there is currently hazardous winter weather, or there will be within the next 24 hours. A winter storm typically includes a combination of wind, snow, ice or sleet. When a warning is in effect, you should stay indoors and stay off the roads until the storm has passed, since conditions outside could potentially be life-threatening. Usually, most of us are used to being able to run to the store or a restaurant to pick up food whenever we need it, but during a winter storm, you may suddenly find yourself limited to the items you have in your kitchen pantry. You may also have access to the food in your fridge, but if you lose your power, perishable food could spoil. As soon as winter begins, especially if you live in an area where winter storms are frequent, it’s smart to stock up on nonperishable foods like canned goods you can keep in your pantry. The Federal Emergency Management Agency (FEMA) recommends you have a nonperishable food supply to last at least three days. If you buy canned goods, make sure you either get cans with pull tabs or that you have a manual can opener you can use. In a power outage, an electric can opener won't be of any use. According to FEMA, you should also have three days’ worth of water for your whole family. The rule of thumb to go by is that you should have one gallon of water per person per day. So, a family of four should have access to at least 12 gallons of drinking water before a storm hits. This list is a good start, but it's also important to think about your and your family's unique needs. Imagine what you might need if you were unable to get to a store or anywhere else for several days. Now, imagine what you might need if your home was without power. You can purchase all the items listed above ahead of time and keep them on hand. The key is to make sure you know exactly where to find everything when you need it. Especially if you lose your power, you'll want to know right away where to locate a flashlight, candles and matches. Make sure you exercise caution when lighting candles in your home. Don't leave them unattended, and always keep a fire extinguisher in a designated spot in case you experience a fire emergency. In addition to these necessary items, if you have kids, it's a good idea to think beyond basic safety and comfort. Kids can get restless quickly when they're stuck inside, especially if the power is out and they're used to being able to watch TV or use a computer. Having some coloring books and crayons or board games at the ready can be a great way of turning what may otherwise be a stressful time into a fun one. When the weather outside becomes hazardous, it's best to stay indoors and off the roads. Most fatalities in winter storms are the result of snow- and ice-related vehicle accidents. If conditions aren't bad enough to keep you from driving, it's still wise to take special precautions. These, of course, include safe driving habits, but they also involve prepping your vehicle for a storm. You'll also want to keep an ice scraper in the car you can use to clear the windshields and windows of any snow or ice that could obstruct your vision. In addition to stocking your car with supplies to ensure your safety, you'll want to prepare the vehicle itself. Make sure you have a full, or at least mostly full, gas tank and enough antifreeze. Make sure everything is in good working order and there are no leaks. It's especially important to inspect your tires to make sure they're properly inflated and have adequate tread. If your tires are worn, now is the time to replace them. Before the onset of a winter storm, make sure you have parked your vehicle where you want it. If you have covered parking, take advantage of that option so your car won't sustain damage from substantial amounts of snow, ice or sleet. When winter is drawing near, you want to check your furnace to make sure it's working correctly. You can have a furnace technician come to your house to conduct an inspection, but you can also do a routine check yourself. Make sure you cut off power to your furnace first. Then, pull out the furnace filter and check to see whether the filter is dirty enough that you need to wash or replace it. Also, check for loose screws on the outside of the furnace and tighten any you find. Make sure the area around the furnace is clear to prevent a fire hazard. You should also keep the areas around air registers throughout your house clear of furniture and objects so heat can flow freely. Once you know it's safe to do so, turn the power supply to your furnace back on and turn your furnace on with the thermostat. The first time you turn on your furnace after it has been off for some months, you can expect to smell burning dust from the heat exchanger. Make sure your carbon monoxide detectors are working, and vacate your home if you think carbon monoxide is leaking. In 2015, close to 400 deaths occurred as the result of unintentional carbon monoxide poisoning. Over a third of those fatalities occurred during December, January and February. For signs your furnace may be leaking carbon monoxide and other reasons you may need to get it repaired or replaced, see our recent article on the topic. Ensuring your furnace is ready to go is an essential step to take before winter weather hits, and especially when harsh conditions are in the forecast. Staying warm should be a top priority, so don't let a faulty furnace stand in the way of your and your family's comfort and safety. 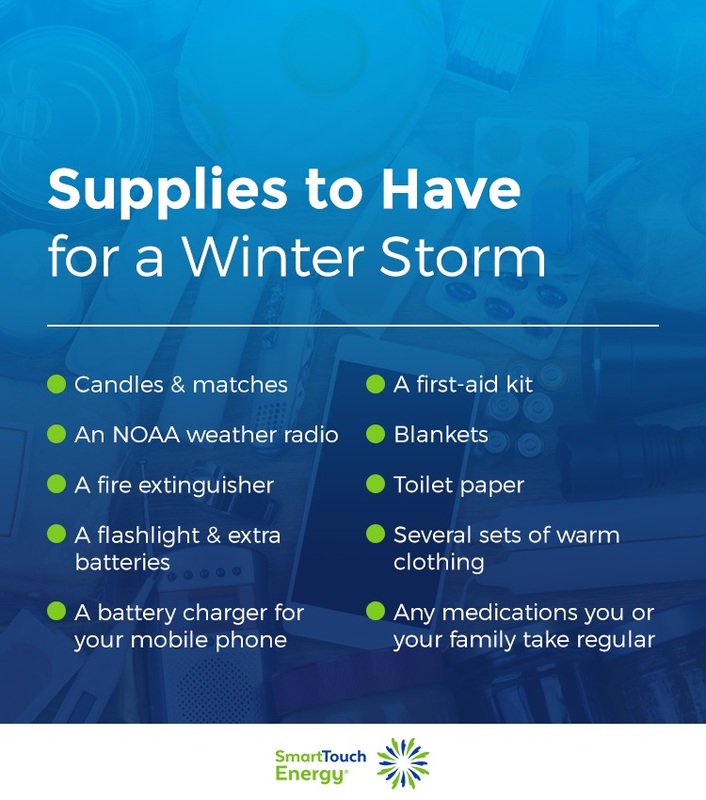 We've already discussed some ways you need to prepare for a potential power outage, such as having a flashlight, candles and nonperishable food items on hand, but there are some other steps you should take to prepare for a winter storm that may knock out your power. If you have a fireplace, make sure the flue is clean, so it won't create a fire hazard. You should inspect your fireplace, chimney and vents at least once a year and have them professionally cleaned out if necessary. Stock up on plenty of wood and kindling to build a fire and keep it going if you lose power for a few days. Some homeowners choose to invest in a generator to keep their power going even when their main power cuts out. A generator can be a worthwhile investment, especially if you live in an area where winter storms have been known to lead to a power outage. If you have a generator, make sure you run it outside, a safe distance from your house. If you don't have a backup method of heating your house, you should take the time to identify a place you could go — assuming the roads are safe enough for travel — to stay warm and safe. See if your community has a designated location, or check with family and friends who you know have generators, fireplaces or woodburning stoves. If you rely on propane or heating oil to heat your home, another essential step to take before winter hits, and especially before a winter storm hits, is to make sure your fuel tank is full. The last time you want to run out of fuel to heat your home is when you get snowed in, and it's freezing outside. Unfortunately, it can be easy to lose track of your fuel levels amid the hustle and bustle of the holidays and other winter storm preparations you're busy making. Out of these options, the easiest and most reliable is to have your fuel delivered. This way, you don't risk forgetting, you can save money and you don't have to use an invasive method to monitor your tank levels. Your heating history and unique needs determine the amount and frequency of deliveries, so you can tailor it to meet your needs without having to buy unnecessary fuel. If you're one of the many American homeowners who use heating oil to keep your house warm in the harsh winter months, let Smart Touch Energy keep your tank supplied through our automatic delivery, so you never risk running out. We can also deliver oil quickly when you run out through our emergency delivery services. If you live in the Northeast, check our list of service areas to see current pricing for your area and to place an order. You're also welcome to contact us with any questions you have. When you partner with Smart Touch Energy, you can expect excellent service and no restrictive contracts or hidden fees. Rest easy knowing you're paying a great price and keeping your family warm throughout the year.